Our services are available in the Potomac and surrounding areas 7 days a week. Services range from a few hours a day to 24/7, live-in care. Georgetown Home Care provides services for adults (18+) in private homes, assisted living communities, hospitals, skilled nursing facilities, and rehabilitation centers. Our Potomac-serving office is just a short, 20-minute drive to Chevy Chase. Just hop on River Road (190) for about 7 miles. 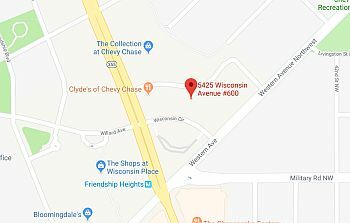 Just after the Willard Avenue Neighborhood Park Trails, turn left onto Willard Ave. Less than a mile away, you’ll cross Wisconsin Avenue and the street will turn into Wisconsin Circle (no need to turn) and our office is on the left.